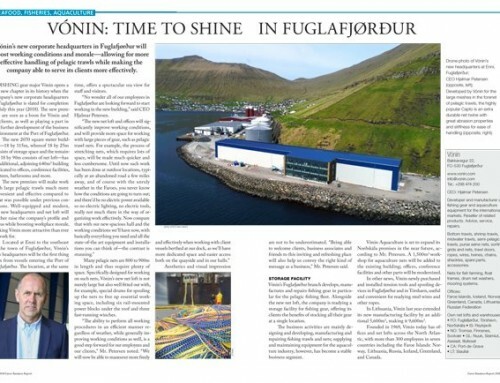 Completely rebuilt after burning down in 2017, Tvøroyri’s new Varðin Pelagic processing plant is equipped with cutting-edge automation technology, unmatched freezing capacity, and computer vision-aided quality assurance. 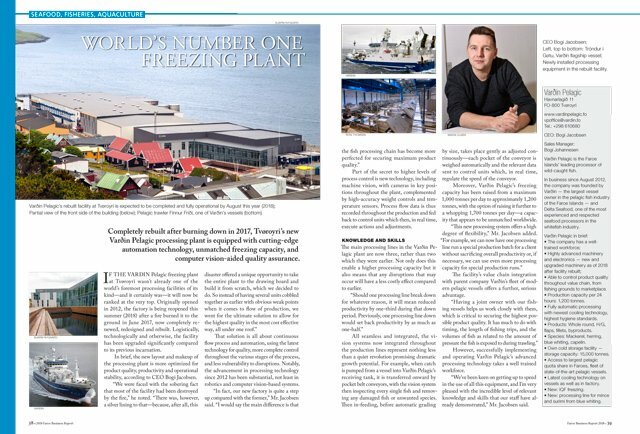 If the Varðin Pelagic freezing plant at Tvøroyri wasn’t already one of the world’s foremost processing facilities of its kind—and it certainly was—it will now be ranked at the very top. Originally opened in 2012, the factory is being reopened this summer (2018) after a fire burned it to the ground in June 2017, now completely renewed, redesigned and rebuilt. Logistically, technologically and otherwise, the facility has been upgraded significantly compared to its previous incarnation. In brief, the new layout and makeup of the processing plant is more optimized for product quality, productivity and operational stability, according to CEO Bogi Jacobsen. That solution is all about continuous flow process and automation, using the latest technology for quality, more complete control throughout the various stages of the process, and less vulnerability to disruptions. Notably, the advancement in processing technology since 2012 has been substantial, not least in robotics and computer vision-based systems. Part of the secret to higher levels of process control is new technology, including machine vision, with cameras in key positions throughout the plant, complemented by high-accuracy weight controls and temperature sensors. Process flow data is thus recorded throughout the production and fed back to control units which then, in real time, execute actions and adjustments. The main processing lines in the Varðin Pelagic plant are now three, rather than two which they were earlier. Not only does this enable a higher processing capacity but it also means that any disruptions that may occur will have a less costly effect compared to earlier. 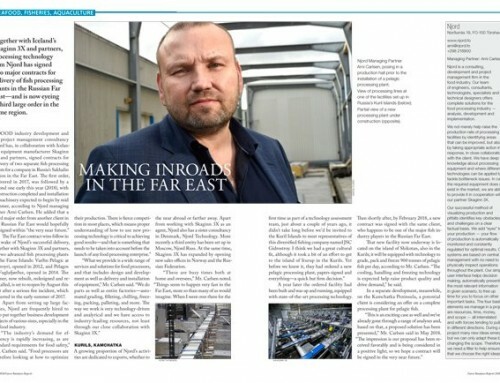 All seamless and integrated, the vision systems now integrated throughout the production lines represent nothing less than a quiet revolution promising dramatic growth potential. For example, when catch is pumped from a vessel into Varðin Pelagic’s receiving tank, it is transferred onward by pocket belt conveyors, with the vision system then inspecting every single fish and removing any damaged fish or unwanted species. Then in-feeding, before automatic grading by size, takes place gently as adjusted continuously—each pocket of the conveyor is weighed automatically and the relevant data sent to control units which, in real time, regulate the speed of the conveyor. 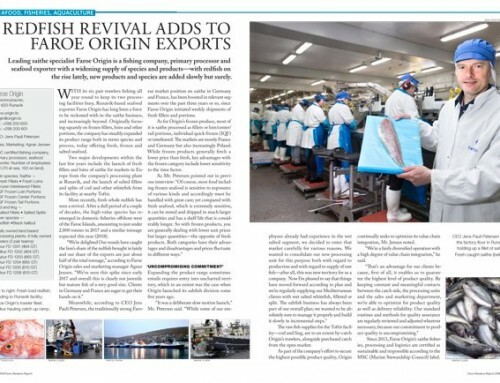 Moreover, Varðin Pelagic’s freezing capacity has been raised from a maximum 1,000 tonnes per day to approximately 1,200 tonnes, with the option of raising it further to a whopping 1,700 tonnes per day—a capacity that appears to be unmatched worldwide. 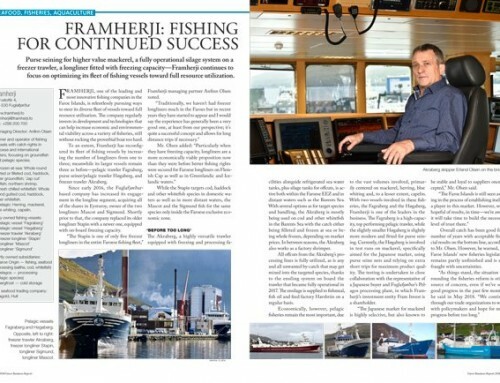 The facility’s value chain integration with parent company Varðin’s fleet of modern pelagic vessels offers a further, serious advantage. 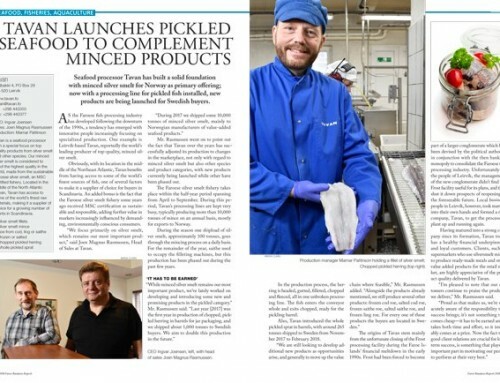 However, successfully implementing and operating Varðin Pelagic’s advanced processing technology takes a well trained workforce. “We’ve been keen on getting up to speed in the use of all this equipment, and I’m very pleased with the incredible level of relevant knowledge and skills that our staff have already demonstrated,” Mr. Jacobsen said.